Colombus has a dedicated department of 85+ usability experts including business analysts, consultants, information architects, and visual designers, who are able to get a 360-degree view of your project and apply the appropriate tools and methods to ensure a clear layout, intuitive usage, transparent navigation, and high interactivity. With years of experience in a variety of business domains Colombus utilizes user-centric, business objectives based approach to UI design. We choose right focus for different types of solutions and their modules. Effectiveness & Visibility — each user’s action should produce a result. 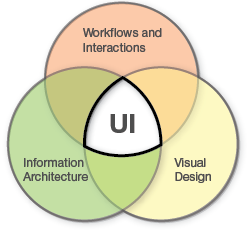 Effective UI increases customer satisfaction and employee productivity, so we carefully treat both frontend and backend usability. Colombus adds maximum visibility to objects, so that users can easily identify the function and take a correct action spending minimum time to accomplish a task. Colombus delivers user-centered UI design paying great attention to the analysis of use cases and business scenarios, highlighting target user groups and identification of critical success factors. At this stage Colombus develops data models, entity relationship schemes and workflow diagrams to eliminate possible vision gaps and serve as guidelines for further project stages. The professional software prototyping is also available at Colombus as a separate service. At the development stage the Colombus’ goal is to deliver functional interfaces as early as possible to leave enough space for possible changes and improvements. Actual interface implementation depends strongly on the chosen technologies, so Colombus strives to cut project costs by utilizing best-practices for the particular technology and get maximum technology benefits / comply with restrictions at the earlier conceptual and prototyping phases. The Colombus QA team executes business scenarios and use cases to detect interface issues or inconsistencies that distract and mislead users from arriving at their goals. Colombus utilizes several testing methodologies and options in order to minimize possible issues at the earliest project stages, enable quick response to changes and organic refinery. The professional software testing is also available at Colombus as a separate service. In most cases (for some types of web apps UI has a very minor importance or even doesn’t require UI at all) visual design is an integral part of web application development project. Colombus always keeps in mind that visual design is a vital tool to increase usability by fastening interface learning, memorability and consistency, and provide additional value to the application making its usage enjoyable. The Colombus graphic design team works in close collaboration with analysts and usability testers, providing high quality results. All the layouts, forms and their elements and controls produced by Colombus designers are tailored to easy HTML slicing, thus avoiding expensive efforts for implementing visuals to the application engine.